(Asheville,NC) – Green Man Brewery is heating things up for Valentine’s Day this year, with the release of their spicy, chocolatey Imperial Black Ale on February 12th. This high gravity beer is brewed with specialty roasted malts and a Mexican brown sugar called Panela. It is then aged on cocoa nibs from Asheville’s French Broad Chocolate, cinnamon, ancho, guajillo, and smoked morita chilis. This limited release is back by popular demand for its second year. 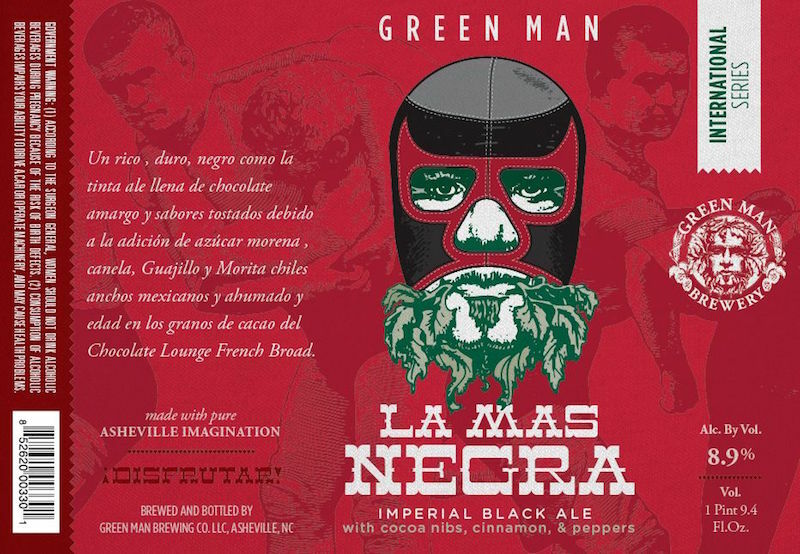 On ratebeer.com La Mas Negra holds an overall score of 99, and it boasts a world-class 97 from Jason Alström of Beer Advocate. Inky black with intense roast and coffee aromas, the flavor blend is an artful combination of cocoa and fruity chilis with just a hint of burn. At 8.9 %, the warming quality of La Mas Negra provides a rich and satisfying palate that complements the distinct notes of chocolate and spice. La Mas Negra is a small batch offering that will be available in 750 mL bottles and on draft at the tasting room. Bottles can be purchased at the brewery and select retailers throughout North Carolina, South Carolina, and Tennessee.